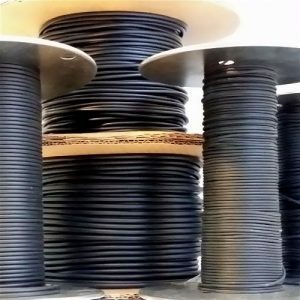 Our black Buna cord is industrial grade. Great for using with any jewelry project. Sold by the meter but you decide how long the cut piece is. Use various metal end caps, create your own from clay or wrap with wire to finish off the ends. This cord hangs nicely and because it is so light many strands can be used together for quite a dramatic result. Use O-rings for a finished look or to keep beads etc. in place. Match the correct size of O-ring to the cord easily. 5mm O-rings ft the 5mm Buna cord and so on. Use our screw eyes in the ends of the really thick cord to attach clasps etc. Super Thick Buna Cord-Make a Statement! Choose from 6, 8 or 12.7mm thicknesses. Sold by the meter but you decide how long the cut piece is. 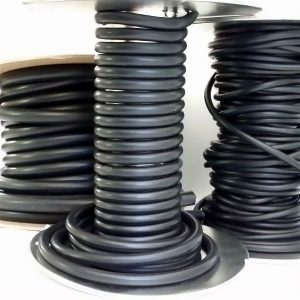 (not pre-cut into 1 meter lengths) We also carry several sizes of O-rings to fit the cords. Here Try using our screw eyes to insert onto the ends of the thick cord. You will then be able to attach jump rings clasps or other fasteners. Turn your small leftover pieces of the thicker buna cords into beads or earrings! Find end caps here. These o-rings will fit the 3mm and 4mm cord snugly. O-rings can be used decoratively or functionally. As stoppers, dividers and as jump rings. Use them to create loops at the end of your buna cord. They will finish off the sides of polymer clay pendants nicely that have been drilled to accept cord. We carry several sizes of O-rings here. Various end caps are here. 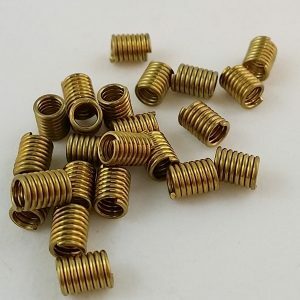 O-rings to fit Buna and other Cording These o-rings will fit the 2mm (up to 3mm cord) O-rings can be used decoratively or functionally. As stoppers, dividers and as jump rings. Use them to create loops at the end of your buna cord. They will finish off the sides of polymer clay pendants nicely that have been drilled to accept cord. We carry several sizes of O-rings here. Various end caps are here. 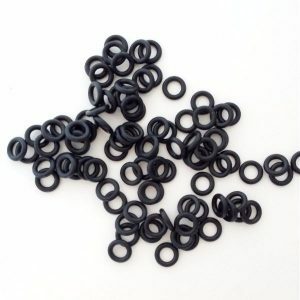 We now carry O-rings in both a Thin and Thick version to fit the 8mm and 12.7mm (1/2") Buna cords. 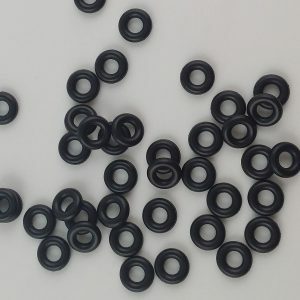 O-rings for 5mm Buna Cord-package of 50 We carry several sizes of O-rings. They can used decoratively or functionally. Use to help finish off the end cap. Use them as spacers or stoppers. Use them as rings for chain maille projects or in place of traditional jump rings. We are proud to represent vendors of quality tools and supplies. Occasionally there may be a defective item and should this happen we will gladly issue a replacement or refund. Other items may also be returned if they are unused and in their original packaging and may be subject to a restocking charge. Please contact us with any questions and before returning merchandise. 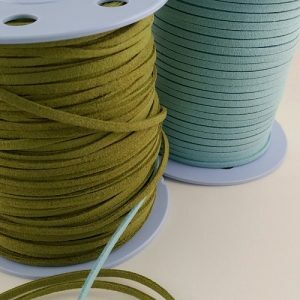 Fantastic alternative to real suede cord. Micro Fibre is more flexible and incredibly soft, yet strong and durable making it ideal for creating necklaces, bracelets or anklets. The specially treated synthetic material does not have a noticeable odor like dyed leather; it will not crack or fray over time and it's washable. Priced per meter. 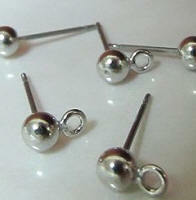 Magnetic Closure-Stainless Steel Clasp (5 sets) ID 8mm Beautiful quality, strong magnetic hold. 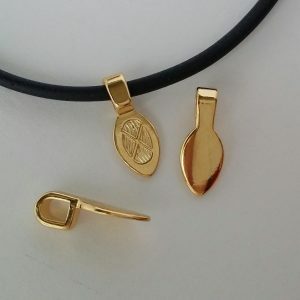 Less expensive alternative to silver plated clasps less than $3 per clasp. 19X9mm Inner dimension is 8 mm Works with any 8 mm cord including our Buna cord. Glue in place using a super glue like Loctite or resin or a 2 part epoxy found here. 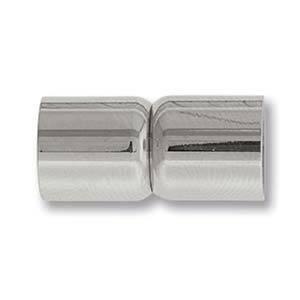 Glue on Bails- 16mm Package of 36 These bails are a lovely, smooth, highly polished choice. The picture shows them on 2.5mm SoftGlass 16mm from top to bottom. Available in both Gold Plate and Silver Plate. Packages of 36 Glue on or embed into polymer clay. 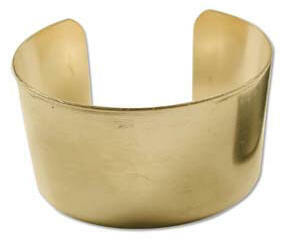 Embellish or use as a form, this brass bracelet cuff is 1.5 " wide and has a flat surface. The circumference of the oval formed by the bracelet is approximately 7.5". It can be made smaller or larger by gently bending. 6 mm Flat, Round Earring Base-Pack of 144- (Stabilizer Clutches sold separately) These surgical steel bases can be glued onto your baked polymer clay earrings. They can be embedded for added strength and durability. Or, attach object to base with strong glue or epoxy. 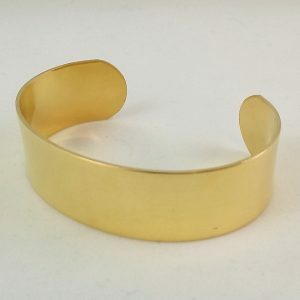 Embellish or use as a form, this brass bracelet cuff is 3/4" wide and has a flat surface. The circumference of the oval formed by the bracelet is approximately 7.5"
Patina Kit-Vintaj Ancient Coin Collection (2pcs)-Aged Bronze & Antique Copper Vintaj Metallic Patinas, like other Vintaj Patinas, are opaque inks specially formulated by Ranger to adhere to metal. They create beautiful and durable patina effects, and easily clean up with water. The Patinas will colorize natural brass, metals and artisan copper findings and filigree for gorgeous jewelry and embellishments. Metallic colors are available in Aged Bronze, Antique Copper, Nouveau Silver, and Victorian Gold. The Metallic Patinas can be blended and layered with a patina palette of 21 hues to create endless patina effects. Mix with Glaze to work as an extender and create a color wash. Sold in sets of two, the color combinations were developed to mimic natural metallic patinas that would occur over time.